Since 1991, Taos Youth Heartline’s mission is to make life better and safer for vulnerable children and families across the Northern New Mexico community. Please join us to celebrate six amazing survivors, spanning all demographics, who will share their inspiring stories of surviving and then thriving, as we also honor all of the survivors among us in Northern New Mexico. 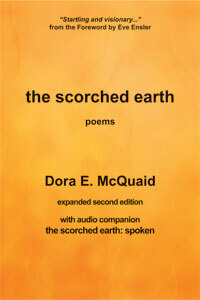 Dora will also be available for a book sale and singing of the scorched earth following the event in the lobby of the Taos Community Auditorium. 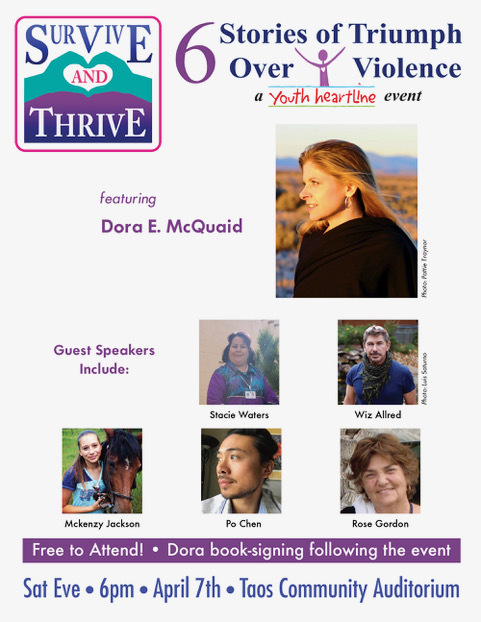 More information at Taos Youth Heartline and the month long celebration of SURVIVE AND THRIVE. Download a printable version of the April 7 2018 SURVIVE AND THRIVE flyer here. I wanted to believe that you were waiting for me. I wanted to believe that your voice, with my name on it, was enough to make me want to stay. I wanted to believe that the way the tendons in your neck moved when you spoke to me meant something more than physics or physiology and that your leveled eyes meant something other than you trying to make sure I got the point of what you meant to say to me, again. I wanted to believe that the arc of the morning star would be enough to pull me with her through the winter, that the pinned moon would know how to hold me, that the swings in the park on Sunday when I pinioned my legs upward above the crossbar would be enough of the guise of freedom to make me curious again. I wanted to believe you. You, who have said my name for so many years that when I hear my own name inside of my head it is you saying it. You, who held my hand in the rain in my mother’s garden, and in the face of the threat that came for me when it came relentless and when there was the one moment of celebration that told us both, together, that I had not been wrong about everything, after all. You reading my poems and me writing them and you knowing to stay silent sometimes when you read them because you knew I wrote when I needed a space where no one told me how wrong I was to have tried that hard. And her telling me that trying that hard had made me a fool. And I loved her anyway. I think of you and of her and how many ways a heart can break and how many ways a heart can be uplifted and how I have learned to live between those two places, and I think of my mother’s broken back and her laughing with me on the phone and how she didn’t ever say: I miss you, honey, until there was reason to know that none of this is forever and love is a way to beat that knowing back. She told me once, her forearms resting on the stainless steel of the kitchen sink as I stretched my legs from one counter top to the other and blew smoke away from her from one more cigarette during the years I smoked after I ran my long legs across the Chester Country farmland just one more morning in a row, her stopping herself from the constant motion for once to say to me: You are beautiful. You are my only daughter. You are too young to have no hope. She said it all before she left me alone in the kitchen, as startling as she ever was, edict over discussion as I contemplated what she understood about what had left me hopeless. Her only daughter who was not her daughter for how I defied any claim of her definition, how genetics made me anomaly to her features. And me, alone then, looking through the double windows at the blue spruce that had been a Christmas tree that I planted after first thaw with my father and, Jesus, but that man loved her in ways that women dream of being loved, and I have loved her, and I have loved you, and I have spent a lifetime writing my way into learning how to answer to people who say my name gently and how to leave a room when my name is said like a thing that could cut you or make you forget yourself. I wanted to believe that loving like a Sunday revival song would make it all possible again, the living and the being and the forgiving and the moment when your breath swallows itself and your ribcage rises and you forget yourself, when you burn the boots that brought you to this point on the road, when the name you tell people is the one that has nothing to do with the history that got you here, when hope is not as dangerous as loving is and praying is both the in-breath and the out-breath, and I believed you, like I believed her, like I learned to believe myself above both of you, first and last of all. I wanted to believe that something of love was waiting for me and that I’d worked my long way around to finding it, only to discover that the only thing waiting for me was myself. There are days when the difference between wanting to believe and believing is vast enough to make me consider the sky and the distance and the bloodbeat, and her voice and your voice, and how, when I’m driven outside to look at that sky, there is no voice there at all. There is the wind and the unknowable and the memory of the distance that becomes possibility and I was named for her, and I answered to both her and to you by that name and when this is done I will rename myself as unknowable, and it will somehow be a synonym of love and of forgiveness and it will be both water and ash in your hands. You can paint your face with it, with how much I loved you, and how much that may have mattered or not mattered at all. During my 17-year academic career, I taught at three different universities and I had only a few tense moments in the classroom with students whose hostilities towards me or other students was alarming. In only one instance did I feel that a student was mentally unstable enough to warrant intervention, a female student during my last semester of teaching, whose behavior and self-care had clearly deteriorated over the last six weeks of the semester, as did her attendance and performance. She came to my end-of-semester open office hours in a rage over her final grade, which reflected her having missed 1/4 of an upper-level seminar, and then cornered and threatened me in my office, while the graduate students in our departmental computer lab across the hall rushed out to check on me, all of them as frightened as I was by this young woman. She was unhinged in a way that I had seen only once before, and I knew that she was disconnected enough to be of significant threat to herself and the people around her. When she saw me motioning to the graduate students in the hallway, she finally left, screaming at the gathered students as she did. I called my department head immediately, shaking uncontrollably, having locked myself in my office for fear of her return and asked my department head what could be done to help this woman and to protect the people around her. He told me: Nothing. We can’t do anything without legal risk because she’s a legal adult, so just be careful for the next few days as the semester ends. I argued with him, explaining her decline over the past six weeks and the intensity of her anger and threats in my office just a few minutes before, as well as my concern that she was having some sort of psychotic break that would make her lethal to herself or the people around her. I wanted some sort of crisis intervention done to help her before that possibility took hold and he told me repeatedly that nothing could be done beyond documenting the incident and the history leading up to it. Be careful, he said. I hung up the phone, printed an Office Hours Cancelled Today” sign and taped it to my door as I left, for fear that this woman would return to carry through on her threats to me in the grip of the suffering she was enduring alone. I have training in counseling, have a background of speaking with people in crisis and I had 17 years of academic teaching experience AND even with the benefit of that combination, I felt utterly ill-prepared to manage one unhinged student cornering me in my office and threatening my life. We weren’t in a classroom with my usual 15 to 20 other students present. We were alone in my office and even with only her and myself to consider, the level of threat was so unexpected and volatile that had the graduate students not come to the door and disrupted that young woman’s escalation, I don’t know how that interaction would have otherwise ended. My point is layered, I suppose, in that we cannot always predict when a person might become mentally unstable enough to pose significant threat to ourselves or others, and in the moment that the threat announces itself, we cannot always know that we will have the skills or resources to navigate that person in their dangerous state in order to protect ourselves, let alone protect 20 other panicked people in the room with us. And as teachers, we should not be expected to bear the responsibility of managing the unmanageable, reasoning with the irrational or protecting a room full of people when our own lives are also at risk. We should not expect our teachers to do what our laws and support systems should have done long before that moment when a student – mentally unstable or just full of blood lust – decides our classrooms or campus offices or hallways are the place where their madness or vengeance will announce itself in bloodshed. Demanding our teachers to take the role of protectors when our laws do not protect those teachers, those students or any one of us from a mentally ill or vengeance-driven killer is a ridiculous expectation. Teachers cannot stop this bloodshed, especially when elected officials taking money from gun lobbyists refuse to pass laws that could actually lessen or stop that bloodshed. Children are dying. We all know this, that children are dying, and thoughts and prayers haven’t done a damn thing to stop that dying. Teachers cannot stop that dying. Misplacing responsibility on them is so transparent and pathetic that I’m dumbfounded and furious and heartbroken again in the face of more children being predictably and preventably killed at school and us being the country where we do NOTHING to stop the killing of our children. First thought: The wintered birds, returned. Second thought: On the phone I kept having to call her back to me. She was listening, elsewhere, beyond me. Third thought: The church bells and trains in the distance, how every part of me now peels toward them. Fourth thought: I knew. Even then, I knew, even as I fingered the possibility of not knowing like a river stone in my left hand. Fifth thought: The days are longer by increments I count by their seconds, knowing winter will end here without me once seeing your face in its light. Sixth thought: I have never once worn the burnt butter doeskin braid wraps that were made for me by the long hands of a Lakota elder, their fringe now hanging over the edge of the bookshelf beneath the Eastern window in first light. 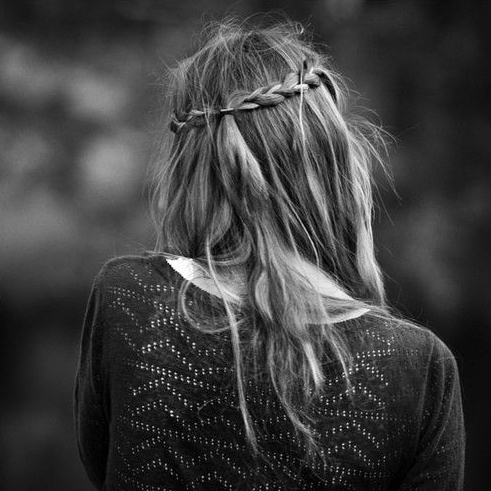 Seventh thought: No one could ever count the number of times in this living that my mother has braided my hair. 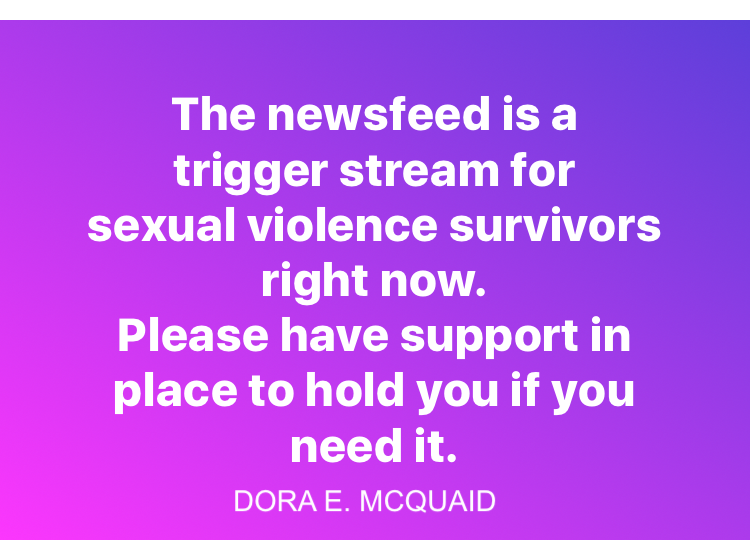 The newsfeed of every media platform is a trigger stream for survivors of sexual violence right now. Between the Nassar case, the ME, TOO movement and the many examples of systemic violence against women and girls with which we are being confronted on a daily basis, many survivors, even the most long-term survivors among us, are feeling confronted and disrupted by the seemingly endless stream of examples of that violence. You are not alone. None of us need ever be alone. 1. Go easy on yourself. Self-blame is the abuse internalized. 2. Breathe. Focus on your breath. Feel your body inhaling and exhaling. Close your eyes if it helps you to focus. Try a meditation app like CALM if your thoughts are wild-horsing in your head. 3. Walk, gently. Move gently. Exercise gently. Anytime you catch yourself exercising to push yourself, remind yourself that gentle care is what you need right now. 4. Get back in your body by doing things that reassure you that you are safe in your body. Use your senses to support your sense of safety. 5. Speak out loud the names and colors of 5 things in the room around you. Identify your surroundings to remind yourself that you are right here in THIS moment and that you SAFE in this moment. 6. If you do not feel safe in this moment, ask yourself what you most need to feel safe and then do everything you can to give yourself what that is, as long as it supports you and does not further harm you. 7. Step away from the triggers as you can. Turn your phone notifications off. Step away from Facebook. Do not watch testimonies that cause you to lose sense of time in the moment. 8. Reach out to someone you trust, and ask that trusted person if he or she can sit with you or listen to you for 10 minutes, or longer, if you need it. Ask for support, and be specific in your asking about what that support looks like in the moment. 9. If you feel as if you are in danger, or if you feel as if you may harm yourself or that you can’t sit with yourself alone in the pain or fear of the moment, reach out to a resource for support. See the listing below of International Resources for Survivors of both Sexual and Domestic Violence. 10. Time alone and silence can help ground us, but do not isolate for too long. Isolation gets harder to break the longer you are stay in it alone. 11.Reach out to someone who reminds you of who you are in your fullness beyond your history and allow their presence to remind you of all that you are now, beyond the experiences that made you a survivor. 12. Write a list of 5 examples of your strength, courage and resiliency. (For example: I took my abuser/assailant to court. I go to therapy or group counseling weekly. I can sleep with the light off most nights now. A list of 5 symbols of your strength, no matter how small or insignificant any symbol may feel. 13. Movement helps. If you can’t exercise, walk or dance or go swing on swings or sit in the sun or stretch your body by extending your arms over your head or behind your back to make more room in your body for you, to move the fear or the grief or the sadness or the anger. 14. Break things or burn things that you do not need, safely. Go throw cracked coffee cups against a concrete wall. Start a fire in your fireplace and burn whatever feels attached to old energy that pains you. Give your anger and/or grief a way to move through your body in ways that do not harm or jeopardize your sense of safety or self. 15. Reach out to another survivor and let her or him know that you are thinking of them. Go have tea or a cocktail together, or go see a movie together or make a meal together. Or simply touch base with one another once a day as a check in for both of you to know that you are not alone and that someone else is present with you. If you are in need of additional support around issues of either sexual and or domestic violence, please see this extensive listing of International Resources for Survivors. Again, please reach out to the people around you and to the appropriate programs for support and assistance. If you are a survivor, I know that you already know how to tend to yourself when you’re feeling triggered, just as I also know that the last few days have put many of us survivors over the edge, including the most long-term and seasoned survivors among us. Some of us are struggling to remember the techniques that we know to take care of ourselves when we are triggered. This is the deal of being triggered – we may need to be reminded of those tools that we can use to ground ourselves back into this moment, where we can foster a sense of safety and trust in our lives and in ourselves again. I can tell you this much: If you are struggling, you are not alone. I can also tell you with some small degree of certainty that you are far stronger than you may probably give yourself credit for, especially when you are feeling triggered. I can also remind you that it is OKAY to be struggling right now and struggling alone does not need to be a sign of your strength. HOW we respond to our needs and ourselves while we are struggling is where our power lies, moment by moment. Remember that sometimes sharing your story doesn’t help you but actually helps the person you are telling. We can be present with one another in even this, and that ability and willingness to be present for and with ourselves and with other survivors is part of how we grow stronger and also part of how the world changes, step-by-step, voice-by-voice. You survived. You are beautiful. You are a badass. We need you and your voice and your presence, so please take care of yourself and stay with us. I am sending so much love to all of you, to every last survivor among us who is strong and brave and resilient enough to live this moment and to choose to keep loving him or herself through it.